Well, more than a couple of days have elapsed since our last posting and promise of a photo. But here it is. As you can see, this photo highlights the machine itself, but does show the master minds - Caterino, Dave and Steve - in the background plotting strategy. 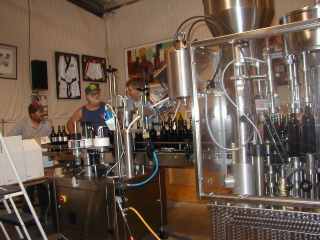 Everything went really well with bottling last week, we took the weekend and yesterday off, but are back at work today. Dave, Michael Watts and Everett Bandman are here today for bottling, and I was just informed by Dave a few minutes ago, that Steve's crew has thus far failed to show up for work, so that Susie, Kate and I will be pressed into service today. I told him we are up to the challenge! It will really just be a matter of loading and unloading bottles on the bottling line, as the guys will be able to take care of the heavy labor of moving the cases themselves around. There must have been some lack of communication between Dave and Steve with regard to getting the crew here. It's too bad it worked out this way because we also had another person volunteer to help us today and we declined that offer since we thought we'd have too many people! Dave says we'll be bottling two lots today - the Petite Sirah and the Aca Modot. Probably a six-hour job if all runs smoothly. I think I've mentioned before that we do have a weather station on our property, the design of which was developed by the University of California at Davis, and so the temperatures we report are actually very accurate. In fact, I used to have a similar station when I lived in Marin County and reported daily temperatures to a local radio station in San Francisco. Since my last posting, we've had several days of high temperatures. The lowest high I can remember in the past few days has been 91 degrees and the lowest low has been around 48. We did have a day a couple of days ago that was 108 high, 54 low. Pat did say that we had 106 when we left for the Dry Creek Winegrowers' picnic a couple of days ago. The official high that day did reach 108 and the high yesterday was 109. According to our Santa Rosa newspaper this morning, Healdsburg was 106 and Cloverdale reported 111 yesterday, so it appears that our weather station is still reporting accurate temperatures since almost everyone would be in agreement that the temperature for Geyserville should be right in the middle of those reported for Cloverdale and Healdsburg, since we are half way between those two towns. The low on Monday morning was in the 60's, which is unusually high for us, but we were back in the 50's this morning. And the high temperature for today was 98 degrees, down 11 degrees from yesterday. We are also experiencing some humidity which is unusual for this area, but it does normally occur a few days a year. Pat and I were hoping that we could bottle the Aca Modot and Petite Sirah today. But we had major problems with the corker today. A very simple spring was pushed out of place and our lack of experience with the equipment delayed the start of bottling until 11:00 a.m. Since Steve's crew did not show up due to a lack of communication (Steve was in a dentist's chair for half the day), we ended up just concentrating on bottling the 259 cases of our premium Bordeaux blend, Aca Modot. We will now have to bottle again tomorrow and hopefully we will complete the bottling of the Petite Sirah and Carignan then. Those are always two of my favorite wines to start drinking immediately, especially the Carignan. So I am looking forward to indulging in those wines tomorrow evening. Dave has his hands full with preparations for bottling the estate Zinfandel, an all-day job, so I thought I'd fill in a bit on what's going on. The crew has been here since early this morning and from my office window, I can see the tank filling up with juice at this very moment. They should be able to start the bottling line soon. They will bottle around 700 cases today which Dave estimates will take about 9 hours, so if they get started soon (let's say 10:00 a.m.), with a half hour break for lunch, that would mean they won't finish until 7:30! But as I think on it some more, maybe the 9 hours included the prep time, so in that case they could be finished as early as 4:30 since it's taken them 3 hours to get everything set up for the bottling. We'll see. On Wednesday, Steve and his crew did show up as planned and they were very efficient in getting both the Petite Sirah and Carignan bottled that day. Susie, Kate, and I got to take the day off, but having to help the day before was a great family experience and if we could bottle the wine 4 hours a day once or twice a week for the entire summer period, the four of us could probably do the entire production ourselves - with a little help with our friends - thanks again Michael and Everett! We have a real appreciation for a crew who has to work on the bottling line all day long, several days in a row. It is very physically exhausting. Today, we have a really big crew here - besides Dave, Steve and "the guys," we have Brendan, Doug Powers, and "Mitch" Pendleton. Maybe they'll take shifts on the line. The actual bottling was completed at 6:35 p.m. yesterday evening. I heard a big roar of joy about 15 minutes prior to that time when I'm guessing air started coming through the hose with the last of the wine from the tank. The guys were exhausted! Brendan and Mitch dumped empty bottles from cases and loaded them onto the line the entire day. Doug and one of Steve's workers, Martin, loaded the full bottles into boxes, taped the boxes and stacked the cases on pallets. Steve supervised the bottling line. Caterino and Salvadore cleaned and restacked the empty barrels. Dave watched everyone work (well, truthfully, he did do some work - I'm just not sure what!). Since the bottling itself didn't begin until almost 11:00 a.m., they didn't stop for lunch. They worked right through for 7-1/2 hours straight. Then Brendan and Steve had to put in an additional hour or two cleaning the equipment afterwards. We finally sat down for a casual dinner at about 9:30, everyone crawled into bed or headed home by midnight, and then Caterino and his crew arrived again at 6:00 a.m. this morning. They vowed to get an earlier start with the bottling today. It's now 9:30 a.m. and they tell me they're ready to roll!